After you have grown accustomed to the beginner strategy, you can begin to look for ways of increasing its profitability. When you enter into the markets, you are looking to make a return, however, you do not win or lose money when you enter the market – you win or lose money when you exit the market. Exiting a trade is therefore generally considered to hold more importance than the entry. If you want to enhance the performance of the beginner strategy, the most effective way is to enhance the exits – that is, letting your winning trades run. The beginner strategy works best when there is a trending market. The nature of the beginner strategy is to capture part of that trend and make consistent profits. 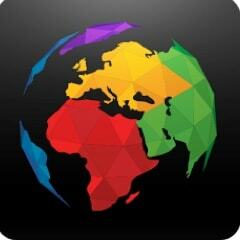 To know when you can let the winners run, you need to be able to recognise when a potential trend can occur. One way to decide this is on the 30 minute chart, when you are determining the market direction. You go to the 30 minute chart and determine the market direction, using the last break of either an up fractal or a down fractal, as normal. The difference is to look at the most recent price action and see if there are any recent swing highs or swing lows that may act as support or resistance, potentially stopping the price. Let's say that the time that you first opened the 30 minute chart is represented by the black vertical line at 8:00. The last break is of an up fractal – this break is shown at 1. Looking to the immediate left of this break, you can see that there is a swing high, shown in the red shaded area at 2. This has the potential to act as resistance, shown as the red resistance line labelled as 3. In this scenario, the market has not broken past the most recent swing high and the price could stop at this level. This indeed happens after a brief period, shown in the red shaded area at 4. 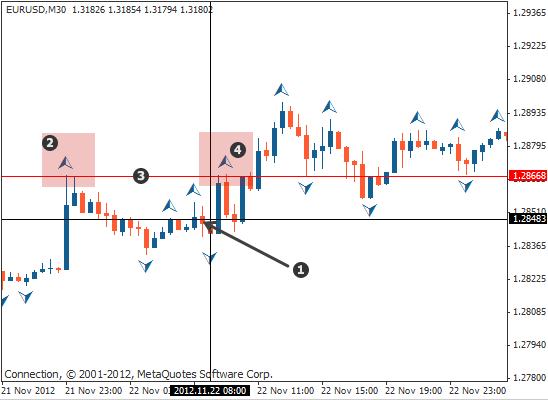 In this instance, you would simply trade the beginner strategy normally and take your profit at the next pivot point. 1 Break of an up fractal indicating that the direction is up – there are no recent swing highs or lows to potentially stop the price. Let's say that in the above scenario, you opened the 30 minute chart at the time represented by the black vertical line at 13:30. The last break was of an up fractal where the break is shown as 1. Looking to the left of the chart, you can see that there are no recent swing highs that can act as resistance. In this case, the price has the potential to carry on in a trend – this indeed happens after the black vertical line. In the scenario above, you can now let any potential winning trades run further than the next pivot point up on the five minute chart. After you have established that the price has the potential to enter into a trend on the 30 minute chart, instead of taking your profit at the pivot point, you can trail your stop using the fractals only, capturing as much of the trend as possible. 1 Price breaks the most recent down fractal indicating the market direction is down – there are no recent swing lows to the right that can potentially stop the price. The last break was of a down fractal, shown as 1. There is no recent swing low that is acting as support – the way is clear for a potential trend to the downside. The green shaded area represents the duration of the trade. First you would wait for an up pointing fractal to be broken, shown as 1, indicating that you can enter a pending Sell Stop order. Your entry would trigger once the down pointing fractal has been broken, shown as 2. 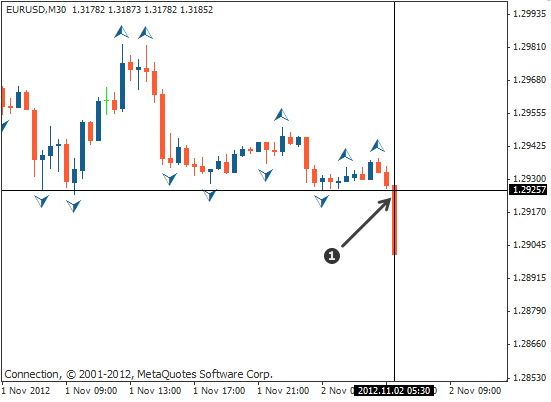 The initial stop loss would be placed at 3. Your profit target would be the next pivot point down shown as 4. This trade would have resulted in 7 pips (minus the spread). The shaded green area represents the duration of the trade. In this case, the entry, shown as orange 1, is triggered when the down fractal has been broken. The initial stop loss is placed at red 1. As the trade develops, the stop loss is moved to the tip of each new confirmed up fractal, shown as red 2, red 3 and eventually red 4 , where the price hits the stop loss and closes the trade. 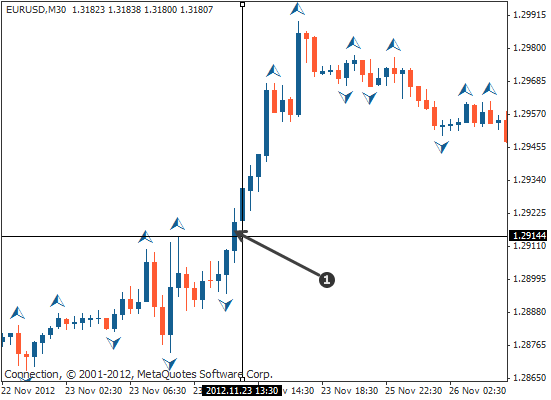 Note that the stop loss is only moved when a fractal that is lower than the previous one appears. This scenario would have resulted in a 17 pip win (minus the spread). You can see from this example that when there are no swing highs or lows on the 30 minute chart to potentially stop the price, the trailing stop method can capture more of the trend, resulting is greater profit potential. after you have grown accustomed to the beginner strategy you can look for ways to enhance its performance. you can do this with the beginner strategy by letting your winners run when the market is likely to enter into a trend. to determine if this is likely, you can see if there are any recent swing lows or highs that may act as support or resistance. if the price on the 30 minute chart has broken through the most recent swing lows or highs, then you can let your trade run and capture more of the trend, than if you took your profit off at the pivot points. you can let the winners run by trailing the stop loss above or below new tips of the new fractals.